An actor for more than sixty years, I began my career at the age of 12, working in plays with Sir Laurence Olivier, Vivien Leigh and Paul Scofield, and played Frankie Abbott in the popular seventies sitcoms Please Sir! and Fenn Street Gang, and many other television shows and touring theatre productions. I also became a novelist in the new millennium and published eight crime novels and a children’s book. I am a ‘Stand alone’ speaker – no power socket or screen required. Minimum fee £75 within ten miles from home. Prepared to travel any distance up to 200 miles. Expenses by public transport, and negotiable fee. During his sixty year career, David Barry has collected many funny anecdotes about famous actors and their often outrageous behaviour, especially when he played Frankie Abbott in the successful television comedies Please Sir! and Fenn Street Gang in the seventies. Stories from London Weekend Television’s bar and what often happened, like the time the Please Sir! cast met Tommy Cooper. He recalls those years with entertaining anecdotes, and things that went wrong while shooting the feature film of Please Sir! often with hilarious consequences. He also tells funny true stories about famous actors who, having had one drop too many, still tried to perform, usually when he toured with actors like Rodney Bewes or Bill Simpson who played Dr Finlay in Dr Finlay’s Casebook, who after consuming too much alcohol brought the set down with a crash one night. And he owns up to some of his own bad behaviour like the time he threw a hot cup of coffee over a newspaper reporter, a story that is worth recounting. And getting legless filming a beer commercial with Joanna Lumley or fiddling the Pepsi Taste Test with singer Joe Brown. These and dozens of other anecdotes take the listeners through more than four decades of actors – and some directors – behaving badly. FROM CHILD ACTOR TO FRANKIE ABBOTT IN "PLEASE SIR!" After a childhood growing up in North Wales, where he recalls always wanting to be an actor, little did David Barry think he would soon be working with actors like Paul Scofield, Harry H Corbett, Anthony Quayle, Laurence Olivier & Vivien Leigh when he began his sixty year career as an actor at the age of 12. He has many hilarious anecdotes, especially of touring Europe with Olivier and Vivien Leigh to some of the Communist block countries at the height of the Cold War in 1957. And Vivien Leigh’s outrageous behaviour when confronted with the demolishing of another London theatre, which brought sympathy and a large donation from Sir Winston Churchill and resulted in David marching through London’s West End with the famous couple. And when he starred as Abbott in Please Sir! he collected stories from actors such as Deryck Guyler, who it transpired is the longest serving cast member of The Mousetrap. 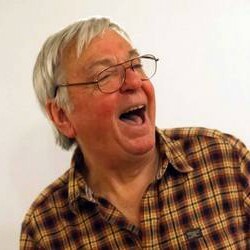 Following his success in Fenn Street Gang, David recalls touring with Bob Grant from On the Buses with often hilarious stories about the well-known actors he toured with during the 1980s and ‘90s, culminating in his full-circle career when he played Frankie Abbott in is seventies, a play about the character in a care home, which enjoyed a successful run at Edinburgh Fringe Festival in 2016. David Barry began writing when he played Frankie Abbott in Fenn Street Gang. He tells the story of his transition from actor to crime writer, when he began to seriously write crime novels, although some of the journey was not easy as one of his labour-of-love projects took almost three decades to get into print. But he recalls those years with good humour, and meeting many great people along the way, taking him to a long-running job as a radio presenter, and then meeting once more Dr Who’s Tom Baker, with whom David worked with in 1969. He has many stories and advice about writing, with a few tantalising extracts from some of his books along the way.